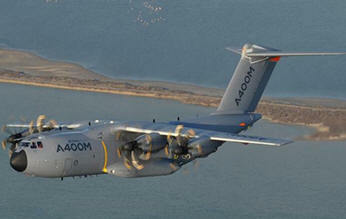 May 21, 2015 - Airbus sends out an Alert Operator Transmission (AOT) to all operators of the A400M four-engine turboprop military transport aircraft informing them about specific checks to be performed on the fleet. This comes after an Airbus A400M, MSN23, crashed shortly after take-off from San Pablo Airport in Seville, Spain while conducting its first test flight, killing four Airbus crew members and seriously injuring two others. To avoid potential risks in any future flights, Airbus has informed the operators about necessary actions to take. In addition, these results have immediately been shared with the official investigation team. The AOT requires Operators to perform one-time specific checks of the Electronic Control Units (ECU) on each of the aircraft’s engines before next flight and introduces additional detailed checks to be carried out in the event of any subsequent engine or ECU replacement. This AOT results from Airbus internal analysis and is issued as part of the Continued Airworthiness activities, independently from the on-going Official investigation. On the day of the crash, the pilot of MSN23, reported to air traffic control they were experiencing a technical failure and needed to make an emergency landing. The Airbus A400M while making its emergency landing the aircraft clipped a electrical pylon on its approach and crashed. A surviving aircrew has told investigators that the aircraft suffered multiple engine failures.